Thank you so much. We will reveal what is going on asap. Thank you for the happy thoughts! Great sentiment Bentley! Helping others is a good way to grab some happy. We always feel happy when we help others. I hope I am guessing right as to what is going on with you all down there. I will keep it to myself, though. I hope that you are too! We are anxiously excited and can't wait to tell all of our friends. Oh how exciting, on assignment, I wonder just WHAT you are up to?????? We can't reveal any details now but hopefully in a few weeks there will be some exciting news on the bayou! On assignment...just like the big guys. We are even using our BFTB airplane!! Have fun. See ya soon! 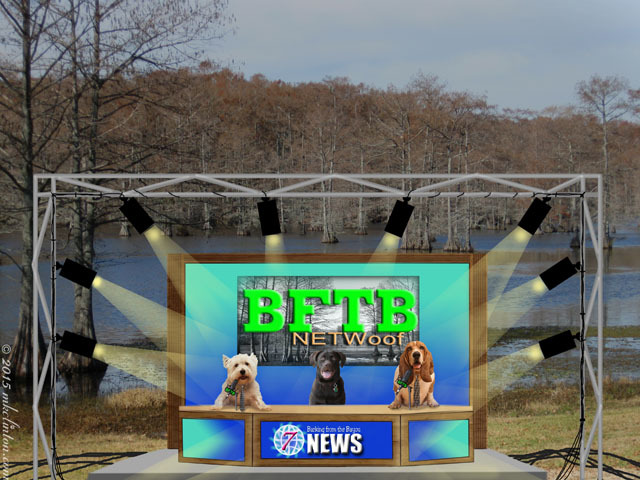 We will hopefully be back with the BFTB news next week. Have fun on your assignment, guys! Thanks! We are working on something REALLY big! We should be back next week with more good news. Whatever is going on, we hope it all turns out well (and hope it's what we think it might be!). We are on pins and needles here! That tiny human is a HUGE part of our assignment. We pray to be able to share exciting news soon. On assignment, huh? We are wondering if you will be broadcasting from the Olympics in South Korea next month? We are considering taking the BFTB plane over for some of the excitement. Hope you are doing something exciting!! Yeah, life does always get in the way. Isn't that annoying?? Hope you had a wooftastic MLK Day!